i just bought a 05 Corolla XRS. when i got it home, i plugged my scangauge into the diagnostic port and got error P2440. 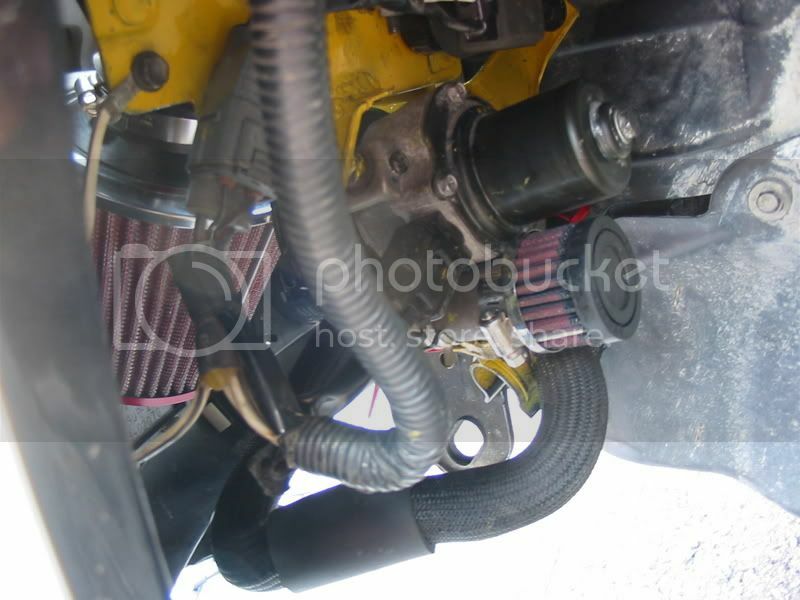 i did a search on this and came up with 'Secondary Air Injection System Switching Valve Stuck Open'. is this a bad problem? how hosed am i ? guess i should have checked it before i bought it. maybe thats whi i got such a good deal. the car has 32K on it and is in other wise good shape. Does it have the stock airbox or aftermarket intake? If aftermarket - it is because the airpump was not modded. If OEM airbox, try resetting the code and see if it comes back. Pretty common code with the Matrix XRS - usually takes a reset with the scantool - drive around and see if it comes back. You could get the code if the engine sat overnight in cold weather and you jumped in, fired it up, and took off before the idle stabilized. O'd also make sure that the flapper valve on the bottom of the OEM airbox is OK and not truely screwed up, but more than likely the throttle body and airpump probably competed for airflow and the airpump lost - so it complained. Yes, it does have an aftermarket intake on it. i will do a search for the airpump mod... maybe you could provide me a link for the mod if you have the time. I checked the site that had the DIY - site is down again. But I do have a link to what the end product will look like (bottom of a Matrix XRS, but very similar to the Corolla XRS airpump mod). Hope that helps some. Good Luck. I did a search for the mod but couldnt find much info. thanks for the pic. I guess i need to crawl under the car and take a look. I assume that the filter is installed where a hose from the factory air box originally was. So, i need a short piece of hose, couple of clamps and a filter...reset the error and drive it. i am just guessing havent looked yet. Would this problem have caused an eratic idle when the engine is cold? the idle speed jumps around alot until the engine is warm. Unsteady idle speed is a different matter (ECM issue in some cases, normal behavior in others). Still - could be related - as the air pump pull air out of the intake (fights the throttle body) so ECM will read one thing, VSV says something else, idle may jump around. Could also be a fouled MAF sensor (common with performance filters and aftermarket intakes), fouled IAT sensor (sits right next to MAF sensor), or dirty throttle body (carbon deposits and varnish - builds up from normal operation).